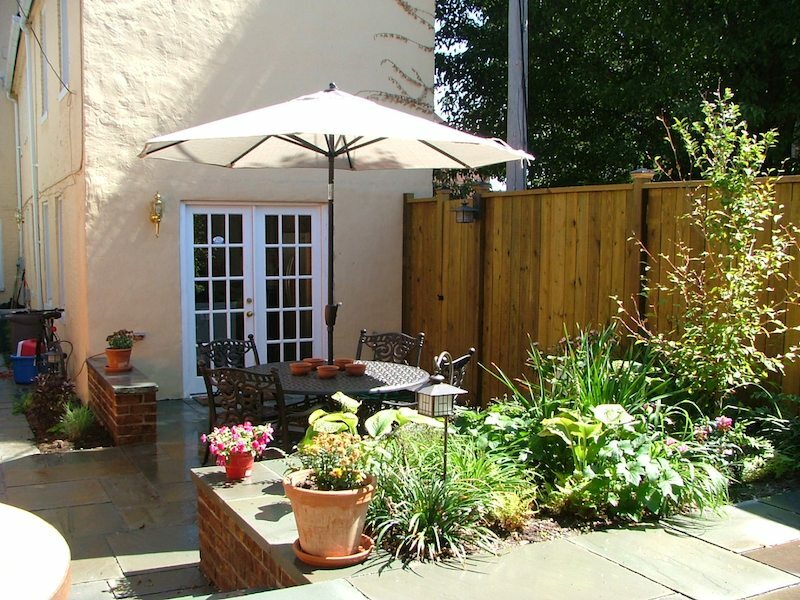 Downtown townhouse courtyard for respite and entertaining with many rooms in a small space. Located in downtown waterfront community in Baltimore, Maryland. 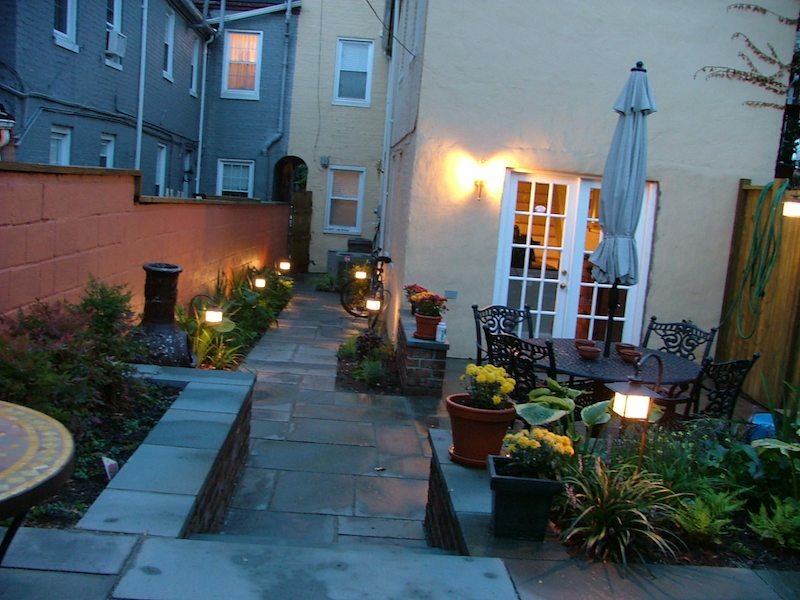 Historic renovated townhouse with small back yard (20'x30'). Property enclosed by a warehouse, garages, and concrete block walls. Utility pole, invasive plant material and pigeon coop create visual clutter. Structural problems with adjacent walls and buildings. 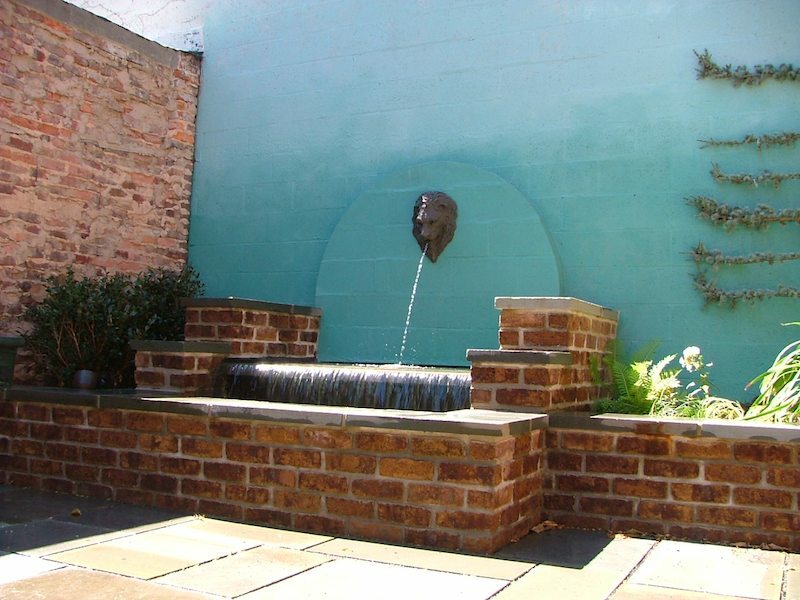 Courtyard with the character of Georgetown or New Orleans. Creation of multiple rooms for small as well as large gatherings. Intimate feel—appealing to the senses. Appropriate style and materials for the architecture and community. Gardens to soften the urban hardness, for cut flowers and for the kitchen. 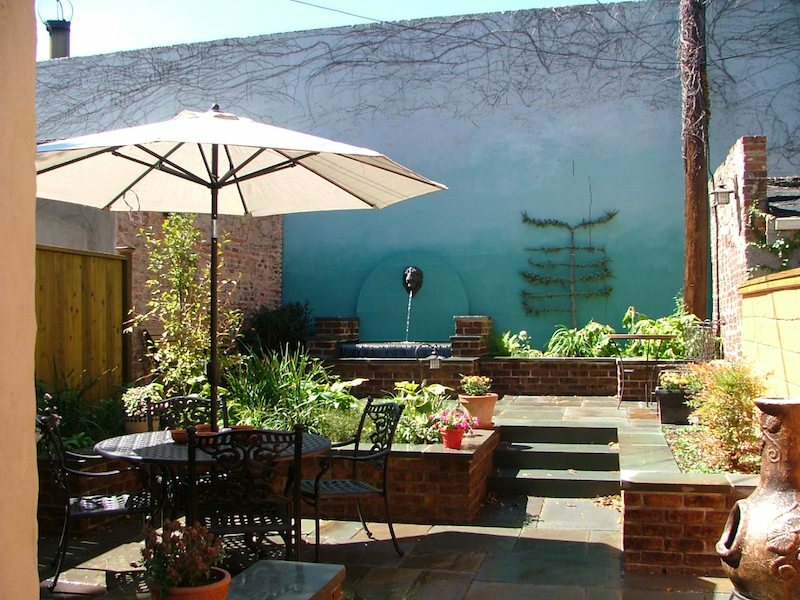 The courtyard provides respite from daily activities, a getaway from the bustle of the city, and a place to experience and enjoy the passing of the seasons. Multiple levels and spaces created several outdoor rooms to accommodate a dinner party or a quiet evening with a glass of wine and a good book by the water feature. Materials selected are consistent with the house - all vertical elements in an "aged" brick and horizontal elements in bluestone. 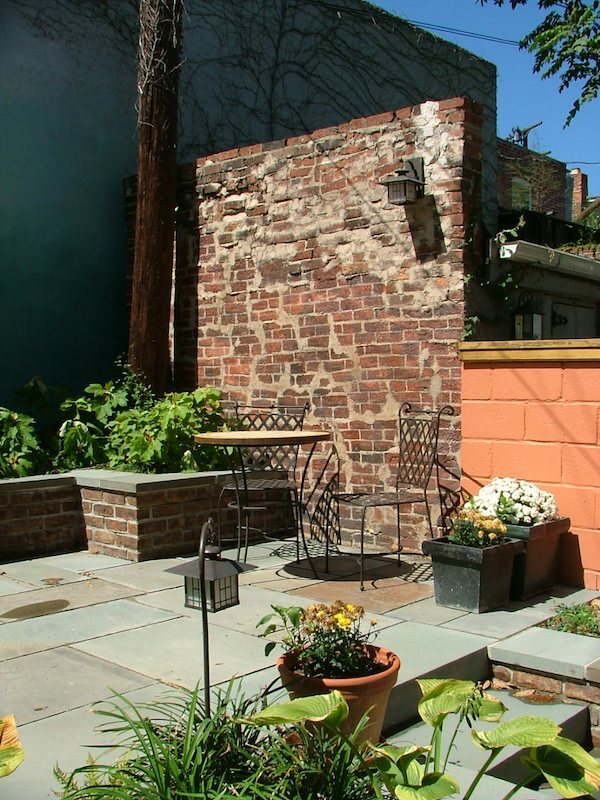 Seat walls provide seating minimizing the need for furniture and define the various outdoor rooms and spaces. The water feature is on axis with the cooking and dining island in the kitchen and is viewed through the large patio doors. Its motion and sound veil the sounds of the city and moderate the microclimate of the courtyard. The harshness of the space was transformed by plants, paint and woodwork. The warehouse wall was transformed by creating a backdrop to the courtyard that transitioned from deep blue of the fountain to the faded blue of the sky. The handmade brick garage wall is exposed on one side while the concrete block garage on the opposite side is faux painted to match. 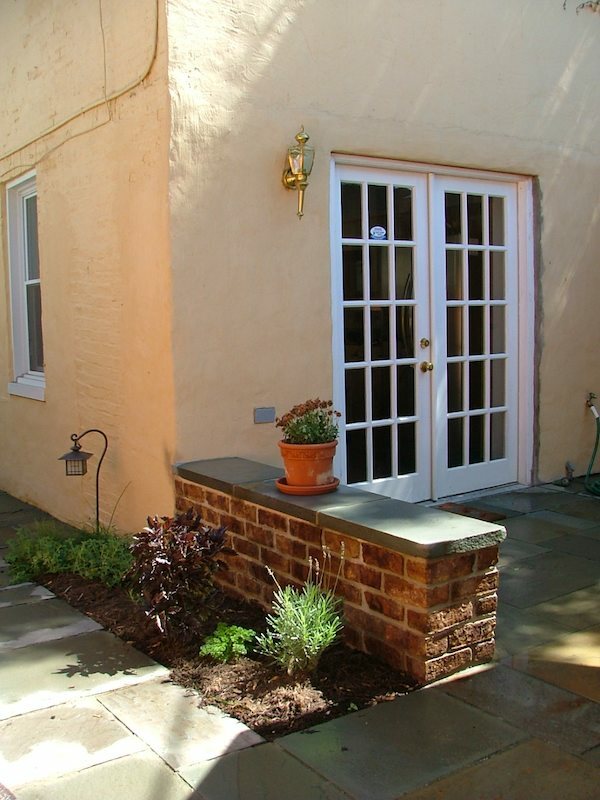 Cedar fencing fronts a restructured block wall while the other is painted in a pastel complementing the house. 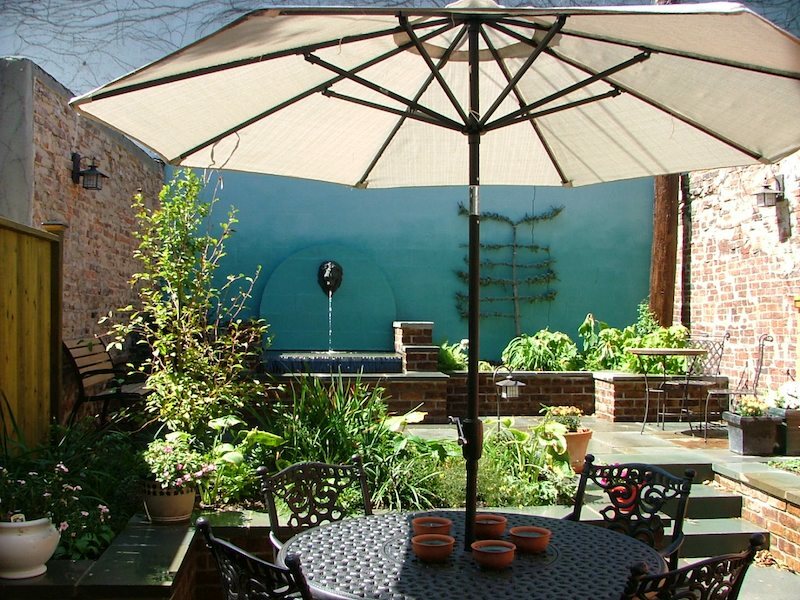 The gardens provide cut flowers for the table, fragrances entice the senses, fresh herbs enhance meals, an espaliered atlas cedar creates a living sculpture, and an opportunity to commune with a spot of nature in the city. 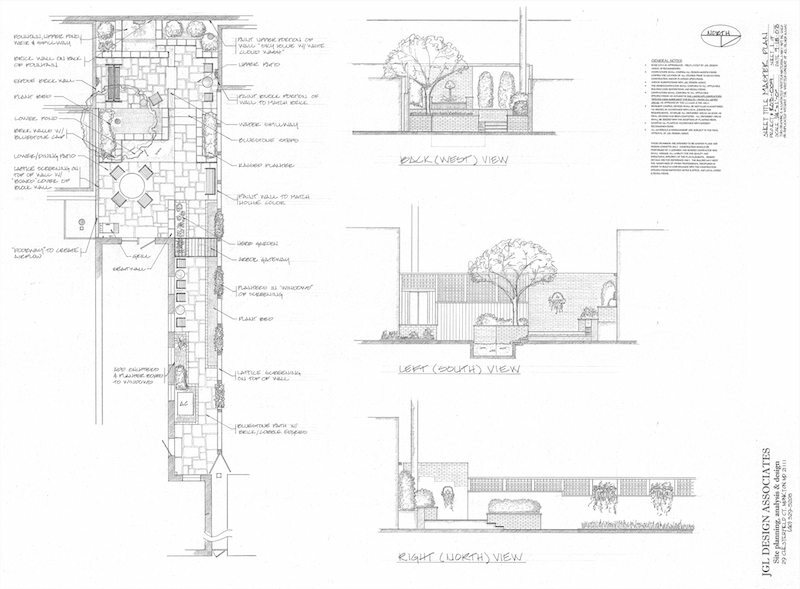 International Landscape & Design—Hardscape, Water Feature, Painting & Woodwork.